Paper Is Part of the Picture (Strathmore Paper Co., 1921). Photograph by Vincent Giordano. The paper of printed matter is more than a common carrier for type. It conveys a message of its own. There are dainty feminine papers, rugged masculine papers, papers that suggest class, caste and quality—that supplement, and sometimes far transcend, the message in words. 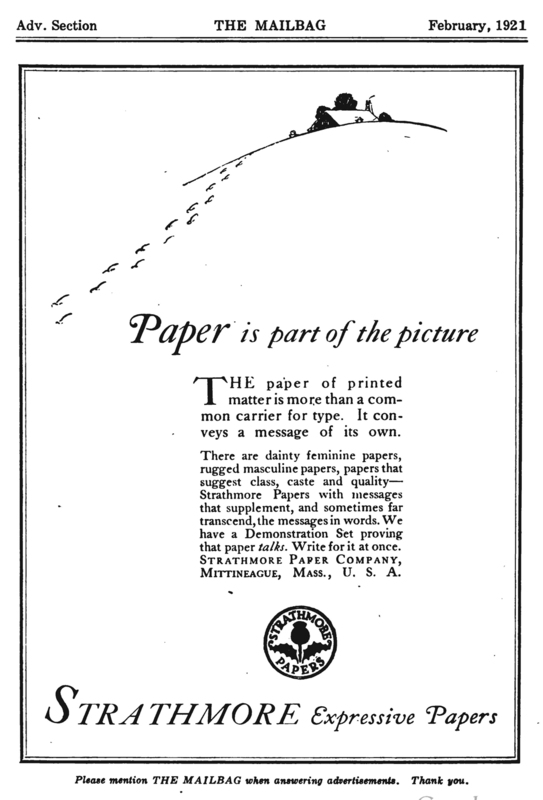 “Paper is part of the Picture” advertisement in The Mailbag (February 1921). 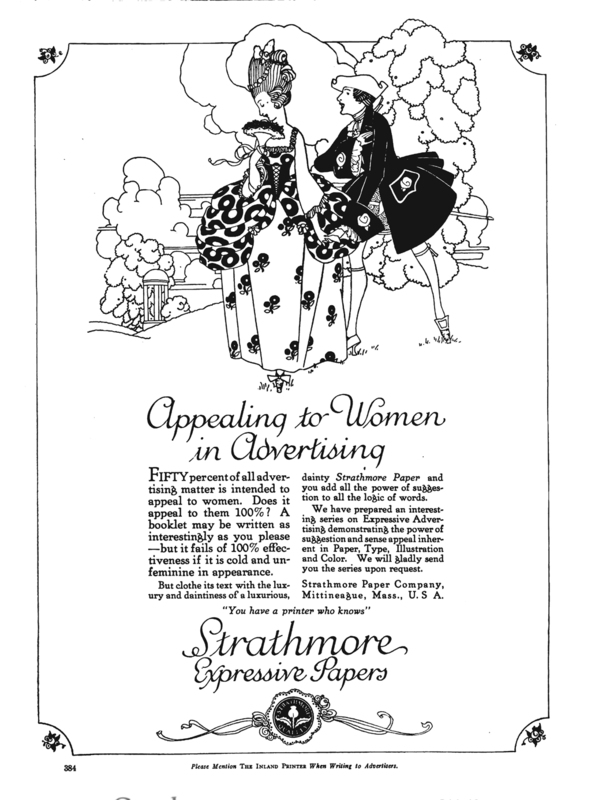 “Appealing to Women in Advertising” advertisement by Strathmore Paper Co. in The Inland Printer vol. 66, no. 4 (December 1920). Illustration probably by The Reeses. 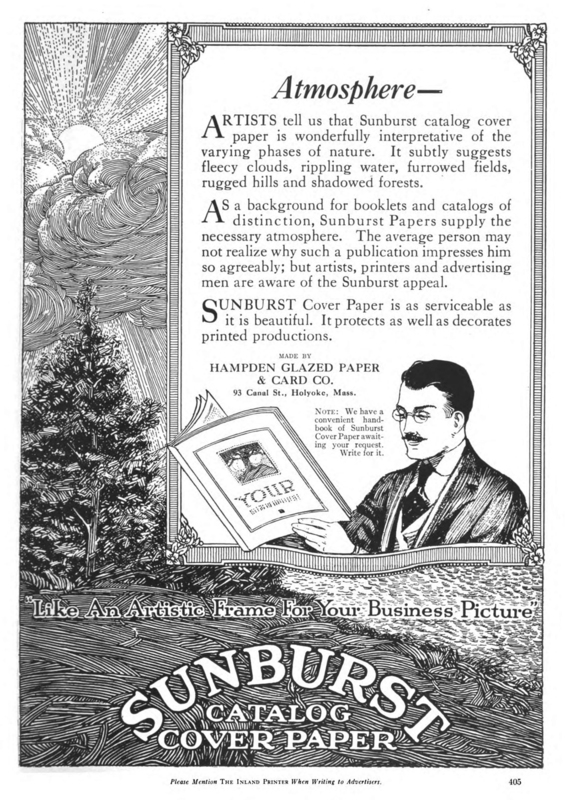 “Atmosphere” advertisement for Sunburst Cover Paper by Hampden Glazed Paper & Card Co. in The Inland Printer vol. 67, no. 4 (June 1921). The text is a scholarly appeal to the intellect of the reader, a sincere and earnest argument to demonstrate the thesis that Strathmore papers, in particular, possess definite practical values for the transmission of ideas. And here is the same picture printed on Strathmore’s Alexandra Japan. The appeal to reason has been eliminated, because the paper tells its own story, leaving to the copywriter the simple task of indicating the catalogue designation of the stock. The drawing is no longer a picture, it is only a part of the picture; the paper, instead of being merely the medium for carrying the artist’s thought, is an organic part of the artist’s equipment; the text, no longer a labored effort to create a desire through an appeal to cold reason, falls into the general scheme as a part and a decorative part of the whole, whose agreeable function it is to point the way to the satisfaction of the desire created by the eye. Venable completely grasped the radical nature of Strathmore’s new approach to selling its papers. As the Secretary of the Whitaker Paper Company—a paper merchant with offices in eleven cities across the United States from Boston to Denver—he was able to readily compare the promotional efforts of Strathmore to those of other paper manufacturers. 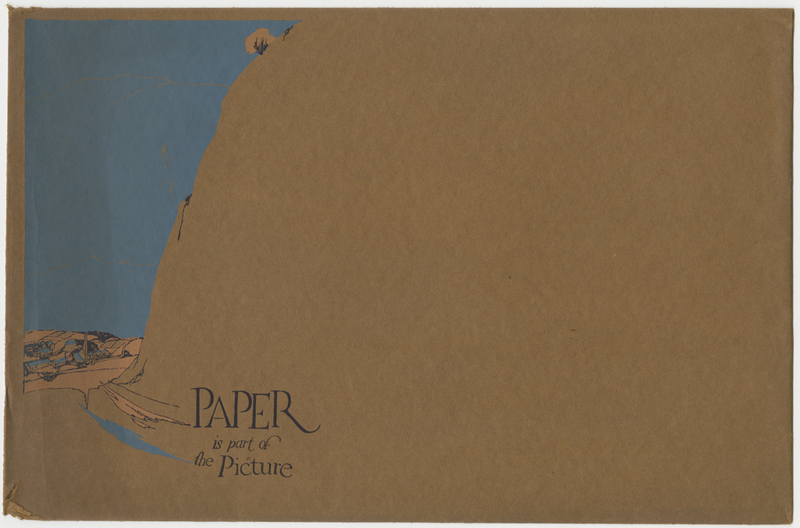 Envelope for Paper is part of the Picture mailer (Strathmore Paper Co., 1921). Designer unknown. The folder of repurposed advertisements was followed up later in 1921 by a series of mailers with original illustrations demonstrating even further how paper could be part of the picture. 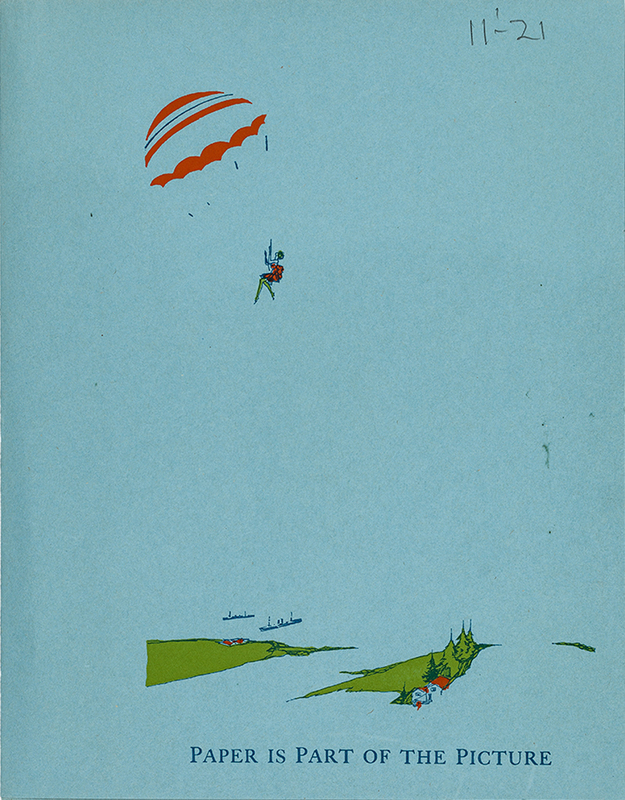 In these mailers paper was the sky for a parachutist (see the top of this post), the grass for a golfer, the ocean for a diver, a hillside near a town (see above). These mailers demonstrated the slogan through weight, color, texture and finish. They were tactile as well as visual. Over the course of the year the Paper Is Part of the Picture campaign had matured. Strathmore had become confident in explaining what it meant and in creating promotional material to back it up. The January 1922 advertisement below (probably designed by Fred G. Cooper) is evidence that the company had reached a milestone in its history. It was truly a new day for Strathmore. “Strathmore Is Part of the Picture” advertisement in The Inland Printer vol. 68, no. 4 (January 1922). 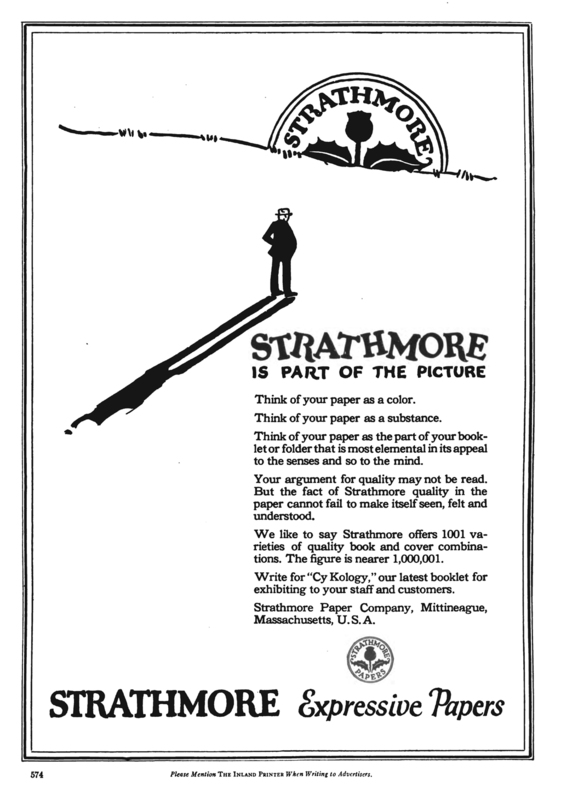 “Paper Is Part of the Picture” was solidly ensconced as Strathmore’s slogan by the end of 1921. It continued in use as a vital part of the company’s promotional efforts throughout its history as an independent paper mill; and sporadically in the decades since 1962 when it has been a subsidiary or brand of other paper companies. The phrase was perfect. It was alliterative, memorable, and apropos. It focused on paper as an element in a product not as a commodity.